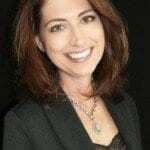 *This is a guest post by Lita Watson of Quick Easy Cook. Have you ever wondered the magic behind the making of ointments or even how they manage to spawn that pleasant outward glow to your skin and hair? Well, allow me to reveal the secret to you. The thing is, for decades, nutrition masters have identified, extracted, utilized and even sold the invaluable nutrients superfoods harbor. Now, what most people don’t know is they naturally occur. Therefore, you can acquire them at a lower cost than you would a beauty emollient. Sounds great, doesn’t it? Ever since man discovered fishing, salmon has been the centerpiece of his sumptuous meals. This is partly because the fish is naturally delicious and primarily because it swims closer to the shore. Nutritionists recommend it mostly for the skin since it is rich in fatty oils and, in particular, the Omega 3. Once in the body, the fats are broken down into polyunsaturated acids which work in unison with selenium. The two facilitate the multiplication of melanin. These pigments reduce sunlight impact on your skin and eventually prevent skin cancer. Additionally, the fish bones contain calcium that strengthens your hair. Other benefits include repairing the cell membranes, helping in detoxification and healing cracked skin. Eager to prepare one? Click here for a detailed article on the top salmon skin roll recipes. If you can find these little-known gems, then your skin and hair will become a sure head-turner. First, almonds are reputable for their Vitamin E which protects the skin against inflammation or swelling. It also accelerates the production of fibrous scleroprotein that prevents hair from weakening and falling off. Secondly, they contain amino acids that oversee collagen formation in the major organs including the skin. Thirdly, the seeds are packed with calcium that is known to support growth and maintenance of the hair’s sturdiness. 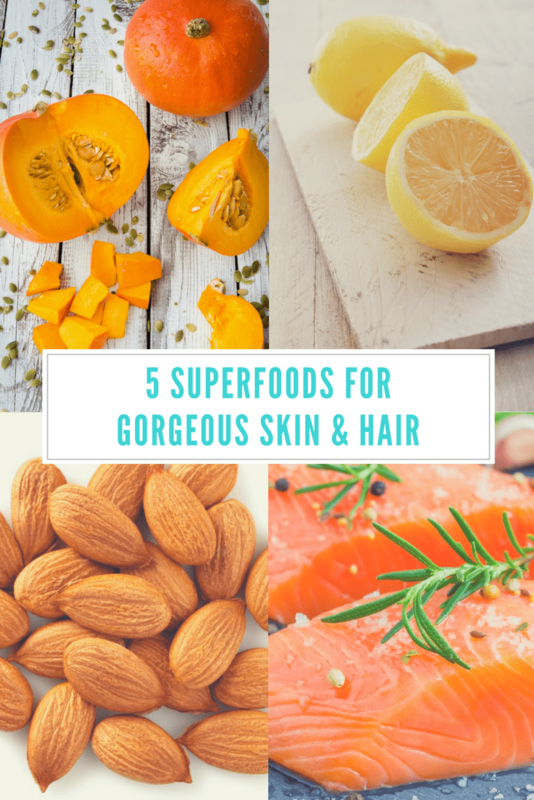 Other benefits include controlling the Ph levels, supplying the body with biotin for stronger hair and proteins for skin growth and development. You can eat Almonds raw, roasted or ground. In this list, the pumpkins are probably the easiest and fastest to grow. They are very versatile fruits with almost every part of them edible. And the best part? They are nutritious with no known allergies or side effects. In many countries, the seeds are the most cherished as they contain iron, biotin, zinc, omega 3 acids, potassium, and proteins. Omega 3 makes your skin supple, zinc aids in collagen formation while iron helps in the multiplication of white blood cells which in turn boost immunity on all organs. This way your skin can fight pathogens that are responsible for diseases and other conditions that damage it. The orange inner part of the pumpkin is rich in vitamins. A pumpkin is best eaten raw in a salad or cooked alongside other meals. Despite their bitter taste, lemons are invaluable towards treatment and sustenance of healthy skin and hair. If you cannot consume them, then you can always apply their juice externally. They are excellent sources of Vitamin C which neutralize oxidants, supports elastin production and collagen formation. Biologically, elastin enhances adhesion of the cells thereby tightening the skin. Through this, aging of the skin slows down. Additionally, you can use lemons to stabilize the body’s pH levels since they are not entirely acidic. They contain minerals that are alkaline in nature. Remember, pH affects the sensitivity and suppleness of the skin. If you are battling wrinkles and stretch marks, kiwis are great fruits to kickstart your healing journey. Except for the outer fuzzy area, the rest of the fruit is edible. The green region contains vitamin C and anti-oxidants. Both are great ingredients for tightening the skin. Also, they reduce excess fats by opening up pores on the skin surface which remove waste products from the body. Did you also know they help fight Cancer? Yes, the antioxidants they carry are perfect at suppressing multiplication of cancer cells. Consume Kiwis raw or mix them with bananas for maximum benefit. Oatmeal, artichokes, and yogurt for fighting acne. Avocados and Sardines for dry skin and stronger hair. And finally, Quinoa and egg whites for wrinkles. See you on the perfection side of beauty. Hi there! I’m Lita, the voice of Quick Easy Cook and I’m absolutely in love with cooking blogs. I’m a beginner in cooking and I try my best to make it quick and easy. Even though, it’s not always quick and easy to keep up with fancy dinners… so I keep learning and blogging about quick and easy ways to create delicious and yummy foods for my two kids and a wonderful husband. Some of these I already love but I didn’t know they’re good for skin and hair! All the more reason to eat them! Thanks for sharing– this a great list! I need to start eating more salmon, I always notice a difference in my skin when I eat it regularly. Ive heard of these other ones, but never kiwi! Sounds amazing and I’m totally tryin it! Omg! You really can learn something new every day! 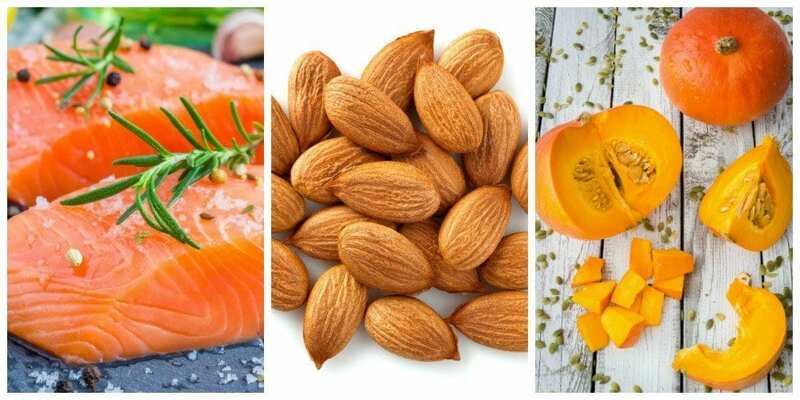 I eat lots of salmon, almonds and even lemon. I didn’t realize how beneficial kiwis and pumpkin are. Definitely gonna start eating them more…love being healthy naturally. Thanks for your tips on the super foods! I eat oatmeal every day! YUS. Fix my terrible skin! It’s amazing what food can do in the beauty department! After being pregnant, I think I need to up my kiwi intake for those lovely stretch marks 🙂 Thanks for sharing! Great article! I need to incorporate this yummy foods more often in my daily diet! Thank you!